Yes, Facebook has its problems, but you may want to reconsider turning your back on the social network. Facebook's not just a place companies go to dredge up embarrassing information, it can be used to your advantage. Here are five reasons why you should become more active on Facebook, not less. You never know, in times like these when the global economy is tanking, Facebook may open opportunities you didn't even know existed. At some point, most people will have to maintain an online destination where others can go to find out more about them. For more and more people and companies, Facebook is becoming that place. Why? Google and other search engine juice. Search for your name and your Facebook profile will likely be at the top of the search results. Try that with your own blog and it will take months, maybe even years for you to climb to that top position. Facebook is easy. Everyone from the high school student to the elderly grandparent can learn how to setup and maintain their Facebook profile. There's no hosting fees or MySQL databases to worry about. You just fill in some personal information, agree to the terms of service and you're ready to post to your wall. Here's the kicker. A recent Wall Street Journal article suggests Facebook could eventually replace LinkedIn as the place to go for online job hunting. Companies are beginning to list jobs on Facebook and use the social network to screen job candidates. People looking for jobs can beef up their profile to showcase their skills and use new Facebook job search applications to apply for positions. Facebook makes it easy to reach out and talk to someone. You can Skype video chat, text chat and even send email-like messages to others. 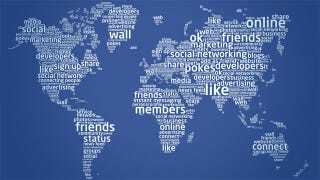 Because all messages are transmitted within the social network, communicating with other Facebook users is fast and easy.